The most luxurious, customizable, therapeutic pillow! The PILLOW of HEALTH is the perfect combination of materials in an adjustable pillow, allowing you to experience the feel of a pillow that will adjust to your needs each night, providing you with the MOST INCREDIBLE QUALITY OF SLEEP you have ever experienced. PILLOW of HEALTH is designed to provide the most restful and comfortable sleep of your life. It's adjustable design and high quality materials make it one of the most luxurious pillows available today. Quality sleep can also benefit your immune system, heart, weight and mind. 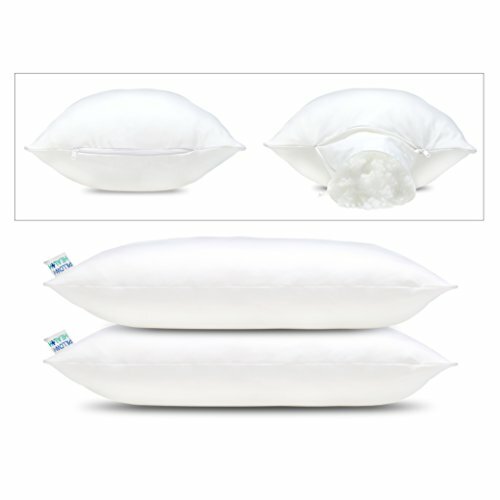 PILLOW of HEALTH was developed by a leading manufacturer of medical equipment. This pillow is far superior to any other pillow on the market today. It is not only comfortable, cool and durable but also certified to contain the healthiest fill components available. WORLDS FIRST EVER ADJUSTABLE PILLOW | Check out PILLOW of HEALTH on Youtube to learn more about the science behind your sleep. ADJUSTABLE FIRMNESS FOR YOUR UNIQUE COMFORT LEVEL | Every pillow comes with a FREE bag of fill! You can add or remove filling to fit your desired firmness level through our proprietary zipper opening to create the perfect level of comfort for your body. HEALTHIEST PILLOW WITH CERTIFIED MEDICAL GRADE FOAM | The pillow is constructed with a SCIENTIFICALLY ENGINEERED MEDICAL GRADE FILL specifically designed for pressure relief to provide optimal comfort and support. PILLOW of HEALTH is CertiPUR-US® certified and is ANTIMICROBIAL, HYPOALLERGENIC and DUST MITE RESISTANT so you can breathe easy. MOISTURE WICKING COVER KEEPS YOU COOL AND DRY | The outer layer is constructed from the most TECHNOLOGICALLY ADVANCED MOISTURE WICKING FABRIC available to keep you cool and dry. Our fabric is 40X MORE BREATHABLE THAN OTHER PILLOW FABRIC providing a cooler and more comfortable temperature all night long, resulting in a better night's rest. LUXURIOUS PREMIUM-QUALITY MATERIALS | PILLOW of HEALTH is made with only the SUPERIOR PROPRIETARY MATERIALS, guaranteed to last, ensuring the best night's sleep you've ever had is the sleep you get to enjoy every night with PILLOW of HEALTH. PILLOW of HEALTH is also proudly MADE IN AMERICA. It is designed to withstand regular machine washing and drying without losing shape or softness. If you have any questions about this product by The Pillow of Health, contact us by completing and submitting the form below. If you are looking for a specif part number, please include it with your message.